I am driven to write this due to a concern that this virulent virus combined with the equally ruthless virus of political correctness may well change our beloved Nation forever, just as it is doing so in Europe, as so dramatically and graphically illustrated by what happened in Cologne on New Year’s Eve and all accross Europe as well. I will send this collection of thoughts and studies to my elected Representatives and Senators asking them to please, please, please give their most important voice to these concerns and to stand up and call this horrific violence exactly what it is, RADICAL ISLAMIC TERRORISM, and say it over and over again, as so many of us in their public want them to do instead of parroting the PC party line that “Islam has nothing to do with it” and other such inanities. I also hope that more of our citizens will become more fully informed of these atrocities by seeing to it that these thoughts, for what they might be worth, are as widely distributed as my limited technological resources may permit. 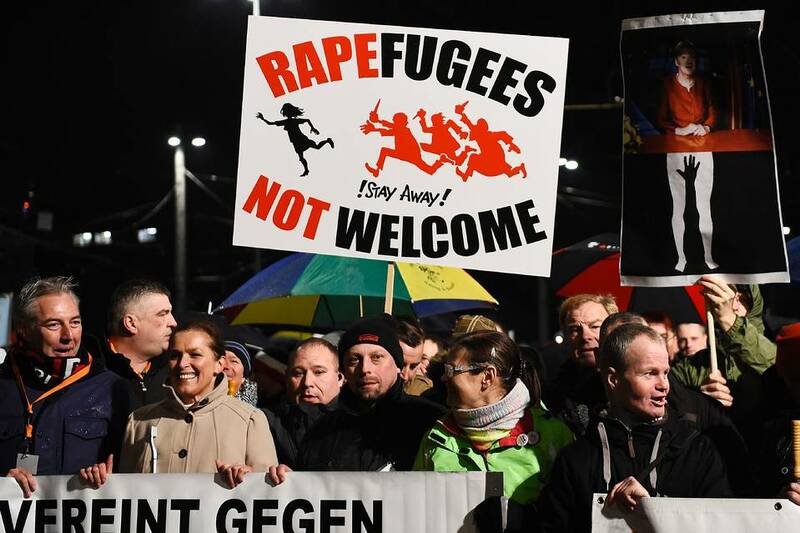 As of this morning’s most recent reports (this is being written on January 13, 2016), the number of cases reported in Cologne alone has now passed 500 and is climbing by the hour. Nearly half the reports are for sexual assault. A similar scene in Berlin was described as “like a war zone”, with explosives going off, hordes of Muslim men shooting guns in all directions and German citizens darting through the chaos trying to get to safety. There were also 133 reports from Hamburg and in Bielefeld 500 Muslim men tried to storm a nightclub. This same article notes that recently another club instituted a policy that banned refugees from the premises to protect the club’s female patrons from “predatory migrant men” who did such things as follow women to the ladies room and hurl verbal instults at them; the owners of the club were labeled “racists” (of course!) and “Nazi pigs” for trying to protect non-Muslim women who committed the “sin”, in the eyes of the Muslim men, of exercising their freedom to go out in public “uncovered”. Chancellor Angela Merkel, the author of this madness, with her policy of inviting a million such migrants into her country in 2015 with another million expected to be invited in 2016, has chastised her own citizens with the statement that “We/Germans must accept that immigrants are more criminal”, a truly astonishing thing to say to people who have just been raped, sodomized, stabbed, brutalized, attacked, threatened in every possible way, had firecrackers exploded down their blouses, etc., etc., but where have we heard that kind of inane blather before? Our own President, while it pains me to have to write that phrase the fact remains for another 12 very frightening months, issues these kinds of totally unmoored from reality statements every day of his life. As in: “combat”, in which American military heroes are being murdered and tortured and slaughtered is, if you just wave enough pixie dust over it, not “combat”, although he and his merry band of followers never quite get around to saying what it actually is. More about some of the far-left fantasies later, but first we need to examine some of the basics about the way these animals have quite literally bitten the hand which only a few months ago was welcoming them at the Munich main train station with teddy bears and water bottles and why continuing to let them pour into Germany, or any country, like the United States, which undoubtedly will be their next target, is simply sheer lunacy. Considering the fact that all reports indicate that all of these attacks have been perpetrated by Muslim men, it is appropriate to examine the tenets of their faith they are claiming to act upon when committing this criminal violence against non-Muslim women. This type of analysis is even more important in light of the continuing statements on the part of Chancellor Merkel, our own public officials, such as our own President, the leading contender for the Democratic nomination for President and most recently, the Mayor of Philadelphia, to the effect that “Islam has nothing whatsoever to do with any of these acts”, in the face of all the evidence (screaming “Allahu Akhbar”, publicly stating, as in the Philadelphia attempted police assasination, that the attacker did it in the name of Islamic State, etc., etc.) It is noteworthy that at the press briefing yesterday morning, the President’s Press Secretary stated, in the teeth of evidence that every person with a sentient mind can interpret as that of an act of radical Islamic terrorism, that the White House was still “wondering” whether it “might be’ an act of terrorism. You can’t make this stuff up! This analysis starts with some basic statements of Islamic belief. “Typically liberals have elided this incoherence by pretending, as President Obama often does, that Western cultures are no better than non-Western cultures in respecting human rights, or by demanding radical liberalism inside the West while supinely accepting violent anti-liberalism outside it. As one who has resisted, to the best of his ability, the affliction brought about by the application of too much pixie dust, a malady all too prevalent “inside the Beltway”, I am not naive enough to believe that the current President will ever change his “contemptible display of political correctness and moral relativism”, to adopt Mr. Davies’ phrase, and so it is left to us to wait patiently, and prayerfully, for another year to pass in the devout hope, a word which used to have actual meaning, that the next administration will bring back “Morning in America”, that beautiful expression used by our last real President.